I had an opportunity to hit this driver last month at the driving range after a nice fellow standing next to me offered. I simply asked him how he liked it, and he said "You're welcome to hit it." "Cool." I replied. I was a little nervous because he was watching me. The pressure was on. Now I knew I couldn't miss the ball because the huge wing-shaped white crown was about the size of a tennis racket. 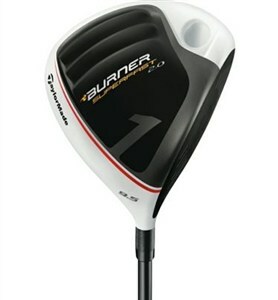 But since the club was so light and the face so big, I swung a lot harder than I do with my driver. Thus, I pulled the ball low and left. I just nervously smiled and teed another one up. On my second swing, I told myself to swing easy, and my tempo was a lot better. The yellow range ball flew of the chocolate-colored face lower than I expected, but then rose slowly before landing and rolling to the back fence. "Nice shot," the friendly man said. I hit a few more with similar results. With what seemed like very easy swings, I was flying it out there about 250 with lots of roll after it landed. I really liked how easy it was to swing, and off-center hits flew almost as far as the ones I caught on the middle. However, I didn't like the sound. It was that annoying "tink" sound that a lot of the game-improving drivers have. And I'm still getting used to Taylormade's black and white color scheme. It makes me really hungry.